In preparation for this year's Southern Cross I decided that it was time for a new helmet - the old Shoei was starting to show it's age. After having a look and trying on a few helmets I ended up spending the bucks on another Shoei (not what I had intended to do). 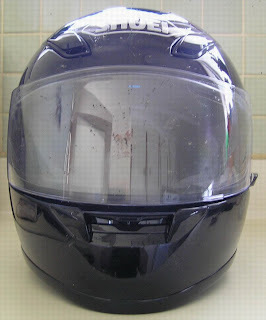 It's an XR-1000 and what sold me on it was the comfort plus some pretty cool features (the vents, no tools visor removal, removable lining etc). Anyway, all new things need a christening so rather than heading over to Manfield to watch other guys riding bikes I headed out for a blat. 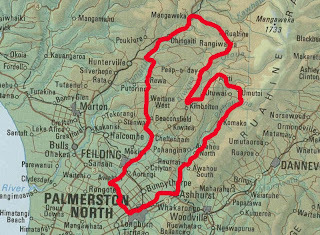 I started by heading out to Ashurst and then around the Pohangina Valley. But instead of turning left and coming back home through Cheltenham I turned right and headed on North towards Rangiwahia. All these back roads are a great blast - windy and hilly - a good workout for bike & rider. The only issue is road condition - you must always be on the lookout for gravel on corners, unsignposted road works and stock (including hawks eating their lunch) on the road. Once back onto the main road at Mangaweka, I turned back towards home via Vinegar Hill and a late lunch in Fielding. All told a ride of just over 220km with most of it on those great back roads. And as you can see from the picture, a great way to "blood" the new noggin protector. As for the helmet, well, the vents definitely work - it actually got a bit chilly in places. It's definitely comfortable and reasonably quiet - I purposely rode minus ear plugs to try it out. Would still normally wear ear plugs though - no matter how good helmets get they can't kill that wind noise completely. Yee hah! Came home from work last night to a package in the mail - the DVD of last year's Rusty Nuts Grand Challenge had finally arrived. So naturally I was forced to sit down and watch it from start to finish. Really impressed with the final product - there's approx 100min's of video and a slide show of 250 photos. Even more impressed when Mark & myself were featured within the 1st minute of the video! There are plenty of interviews with people before and after the ride, scenes from the various checkpoints and some great shots of bikes going past the cameras at all times of the day & night. Even an interview with some idiot on a Bandit who got hit in the head by a speeding bird (guess who). Like I mentioned above, it was quite cool to see us on the video and we or our bikes are actually in it quite a bit at the start of the video but my favourite was watching (and listening to) the two of us take off from the last checkpoint - shame I still had the original muffler on the bike. Really made me look forward to this year's ride. With the bike back in the shed and some awesome weather (better not complain about the heat) Sunday was the day to go for a quiet ride to check things out and make sure the bike was ok. 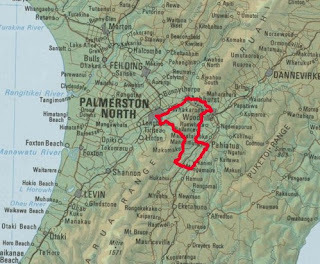 The map shows the little loop I took (about 120km) and I started by heading over the Pahiatua track (yep bikes working!) then around through Mangamire and into Pahiatua. Back over the Pahiatua track as far as the Balance turn-off, thru to Balance then Woodville and on home over the Saddle (some roadworks and the usual crap on the road). All done! Picked up the bike this morning. Great to have it fixed so quickly, the weather's great at the moment so guess what I'm doing tomorrow! Good news on the bike repair front. Claim has been approved and bike shop reports little damage: just need a new mudguard ($180) and the forks straightened (slightly twisted). Should be on the road in no time hopefully. Guy that hit me get's off lightly (or his insurance company), cheap repairs although he'll probably loose his no claim bonus and see a hike in his premiums. 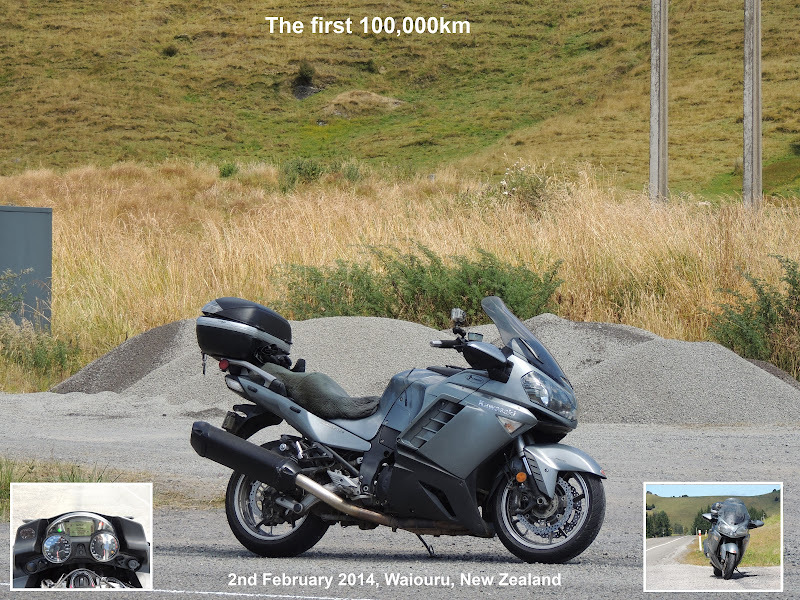 Southern Cross is still a goer - thank the god of motorcycling adventures! I've been busy adding a few bits and pieces to my website lately. Found some neat free gadgets to add to it: guestbook (please sign), poll, link to a group of created for bike orientated discussions and more. Check out the new page with showing my dream shed and vote for your favourite bike. New on the Kneeslider - a video of the New GTR1400 being put thru it's paces. Looks great carving up some delicious looking bends! 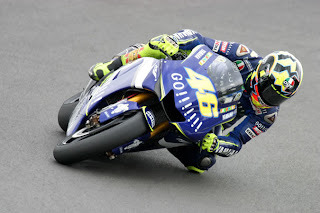 I've posted the below rant on my rant blog to give you my opinion of drivers who don't see motorcyclists. 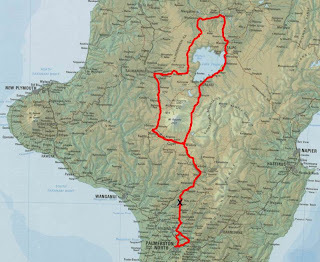 With the weather continuing to play ball in dishing up plenty of fine days, Mark and some guys he works for decided a decent ride was in order and planned this one: a quick lap around Lake Taupo, a round trip of about 670km. We left Palmy in fine weather and headed out through Colyton and over Vinegar Hill - a great piece of road. Some road works on the hill but nothing too bad. All too soon this was all over and we were back onto boring old State Highway 1 keeping our eyes peeled for cops. North of Waiouru things started looking a bit black and just as we were coming off the Desert Road we started getting a light rain. Just enough for Dave & Bill to need their wet weather gear. 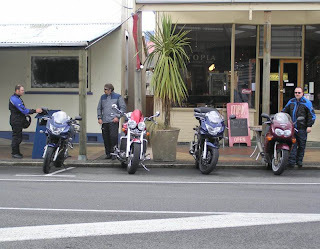 Then it was onto Taupo where we stopped at Wairaki for lunch and fuel. We then headed on back up Highway 1 until the turnoff to Highway 30 which took us on over to Whakamaru. Very wet roads in places and some quite heavy rain at times. We turned off at Whakamaru onto Highway 32 to take us back around the Western side of the lake. At the end of 32 we turned onto 41 which took us over to Tamarunui. Rather than head into Tamarunui we turned south on Highway 4 and on towards National Park. We then turned off onto Highway 49 and into Ohakune. Quarter to 3 so time to stop for a drink. After our drink it was back into the rain and onto Waiouru where it was time for the bikes to get a top up before the cruise home. The rain/wet roads stayed with us off and on until we were well south of Taihape when all of a sudden it was sunny again. Turning back onto one of our favourite roads (Vinegar Hill) again it was time for a play. I got away on the other guys a bit until just before Rewa where disaster struck. Pulling up to a stop at the Bailey bridge, the van in front of me had just got onto the bridge when he decided that he'd better let the car that was on the bridge come over first. So what's he do? Throw the van into reverse and back up about 3-4m and drive into me! No amount of shouting & beeping of my horn could break through to him (good stereo in van) until he finally hit me. He finally realised something was wrong when my yelling at him broke through the racket of his radio. I yelled at him to get over the bridge and pull over. Once over the other side a very brave young joker got out of his van and walked back to me - me given him a bollicking all the way. The usual story - I didn't see ya. I pointed out that he might have seen me if he had been looking! Time to get his details off him and check out the bike - luckily I'd managed to keep it upright. The front guard was broken and cracked all over and the forks were slightly twisted and that was about all we could see. I taped the guard up so it wouldn't fly off and damage anything else and pottered off quietly to see how she handled. Seemed to go ok even with the handlebars slightly askew, but in slow corners things felt a bit funny - never mind, got home ok.
Haven't seen anything about the new Yamaha GP bike yet but found a blog with a bit of info on the new Honda V4.